Metal strapping seals designed for use with steel strapping and steel strapping combination tools, simply put the seal around the section of strapping which you would like to secure and seal using one of our steel strapping sealing tools. When purchasing metal seals for steel strapping ensure that you are purchasing the correct seal size for the width of strapping you are using. 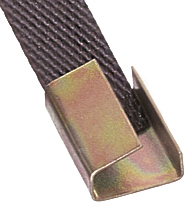 2 different width metal seals are available to correspond with our widths of steel strapping.